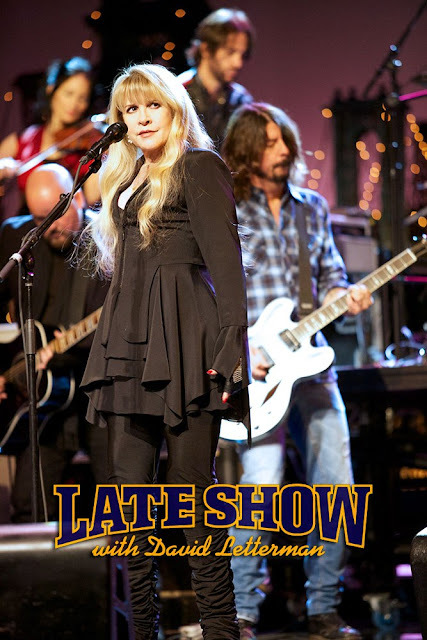 Fleetwood Mac News: Video: Stevie Nicks on The Late Show with David Letterman "You Can't Fix This"
Video: Stevie Nicks on The Late Show with David Letterman "You Can't Fix This"
Stevie did a great job tonight... She looked great and sounded awesome! If you are in the West... hang on to watch or set your DVR or something. She's got a cold and it's apparent when she speaks to Letterman at the end, but it didn't affect her singing, in fact she made it work for her, and it gave her voice a deeper register which I thought sounded kinda cool! Great message and story telling in this song... She looked so tiny up there with all those men! Even with the boots on! Oh God, The Uniform, The Uniform, please, not The Uniform! This uniform is way better than that hideous ruffled thing she wore in New York recently. Loving the ruffled velvet boots. But the uniform!! I want to see some 80s doily pattern white frill and something a bit more inventive/DIFFERENT for a change. But damn she looks great! I agree with the above comment regarding the "hideous ruffled thing." That didn't compliment her at all. She looks good on David Letterman and thank God she isn't wearing those sun glasses. That's the thinnest I've seen her legs look in a photo since the 1980s. Damn! Dave Grohl is good for Stevie! This looks like a slightly different Margi Kent uniform...shorter skirt thing...shiny legging things...hanging fabric things enhance/accentuate her figure....and what great skin. Isn't she married to Dave Letterman? LOL. I have loved Stevie for many, many years now. For every timeline moment in my life, her songs have healed me, made me cry, comforted me, and truly have made me rock out to her. Love whatever she wears...she is absolutely beautiful in spirit and soul. There's a YouTube clip of the performance posted by pearljamfan2012... it sounds great but somehow that clip got reeaaallly s-l-o-w-e-d down! Like a 45 rpm record played on "33"! I honestly thought Dave Letterman was drunk wasted out of his mind until I realized the speed "anomoly". Just watched it live and Stevie kicked the song's azz! I don't think that much of what she's wearing nowadays compliments her new slimmer/sexier figure at all. I think she's able to pull off some of the more thin, light outfits she wore during the Bella Donna/late 70s/80s era. I second the comment that she looked good without all the ruffles and no sunglasses. She did really well. Now I thought Lori was showing her age; and I mean that with love. Joseph, don't you see the irony of what you just said? The reason you THINK she's slimmer/sexier is because of her uniform. I suspect she's about the same size as she's been over the past 15 years, but, like it or not, her "uniform" is working for her. If she was wearing a spaghetti strap satin dress with a lace shawl, I suspect we would be advising her to wear something more age/weight appropriate. Wow! Stevie rocked it and looked beautiful doing it! Love the outfit. I am not 100% in love with the song. It's not the best that she has written. The song really isn't one of her best - it hasn't got much of a melody or a hook and the words never rise above cliche - but she performs well. I understand that the cut of the uniform works for a woman of a "certain age" but it could benefit from some shimmery and/or sparkly touches at the very least. She nailed it, the end-- yammer on. Not loving the song. Trite for her. Love the woman's writing usually though and she looks awesome. When I heard the ‘Players’ were performing with Stevie on Late Night, on Valentine’s Day nonetheless, I knew she would be singing “You Can’t Fix This,” and I eagerly awaited the outcome, wondering if it would be a good fit as I knew they wouldn’t dare be performing any Fleetwood Mac songs, as they have recently, because the Mac are gearing up for their World Tour. The song did have a good message, reminiscent of “Gold Dust Woman,” with ‘the Devil’ being the drug heroin and a play on the word ‘Fix’ in the title. The point really being missed here, buried under the superficial critiques, is the message about real music and real performances. Dave Ghrol, who sat and chatted with Letterman just prior to the performance, discussed this and that’s basically what the message is about in his documentary “Sound City.” Stevie has remained the artist she has been for decades, while the changing fads of the times pass her by. She records her music raw, without the use of auto-tune and a bunch of fancy studio magic. Like the Rock Goddesses who’ve come before her, such as Janis Joplin, what you see is what you get. She does not lip-synch. She has a nasty winter cold and she still shows up to sing live. These traits, although maybe from an ‘old-school’ era gone by, are true and authentic, and should be appreciated and respected. Can't believe she'll be 65 in 3 months! I thought the song had powerful delivery and lyrics. Well done. Plus she looks fabulous. Don't understand what people didn't like about it, but oh well, to each their own. OMG! Stevie's performance reminds of her Bella Donna days or the first time she sang "Moonlight". I love this song and band. Even better, while driving home tonight, I heard the DJ on the local rock station talk about Stevie's and Dave Grohl's performance in NY and on Letterman. He said the station posted the Letterman performance on their website! He called Stevie's performance "cool". I almost drove off the road. I have been waiting for a radio station to talk about Stevie and new music for about 2 years. This song and group did it!! Rock on "Solidier's Angel". Here's the studio recording of You Can't Fix This. I can't get this song out of my head! Loving it! I would say she hit this one out of the ballpark. Not a fantastic song, but wow - what a fantastic band. if u listen to the song its just like any stevie song it grows on u. the more u play it the more u will love it. Bravo Stevie I love it. Stevie's most substantial song in years. You Can't Fix This is what I was hoping for as a first single from In Your Dreams. Better late than never. "She records her music raw, without the use of auto-tune and a bunch of fancy studio magic. Like the Rock Goddesses who’ve come before her, such as Janis Joplin, what you see is what you get. She does not lip-synch. She has a nasty winter cold and she still shows up to sing live. These traits, although maybe from an ‘old-school’ era gone by, are true and authentic, and should be appreciated and respected." Even if the song and performance is terrible? Get a grip! Sorry. I love Stevie too, but YOU CAN'T FIX THIS is not one of her best efforts. The tonal quality of it is monotone for most of song and the lyrics are so simplistic that there is really no rythme or structure. I wish Stevie fans were a little more objective than just fans that worship the ground she walks on. She could record anything , literally, and there would be people saying how stellar it is. Yes you're right. She could record Mary Had a Little Lamb and it WOULD be stellar. That is just the way she rolls. She puts her passion and love into all she does. That's what some Stevie fans see. It is something beyond lyrics and rhythm, though they certainly add to the experience. I know a lot of her fans know what I'm talking about. We're not seeing "a bunch of Debbie Downers in the room..."
Love her "uniforms!" Always amazed to see how many thousands of black pieces of wardrobe she has to mix and match, and how creative and different they all are. Yes, this one very cute on her and shows her lovely legs. She's lucky she can sing in the corseted waists but i do think her rear is a little larger than she would like and thus the sometimes "bustle" styles. But i love them!! very glamourous, feminine and whimsical, and love the "frills" too! Those skirts are very finely made and i appreciate that aspect. I did prefer the longer ankle length lace of the early 2000's but I guess she doesn't need to hide in them and tired of them. oh, i even like the raggedy in front, but stylish, bolero she had on. You could see it was a bolero from the back. It's very on trend. No, she didn't need it to hide but I love the variety she mixes. Enjoyed the feather boa on her wrist on some recent appearances too. Luv ya, Stevie! you look Great! Props to Stevie for mentioning to Letterman that "Buckingham/Nicks" album was recorded there. Never miss a plug! Love the red lipstick and nails for TV. I understand and appreciate the lighter shades of lipstick and go there myself, too. But even my brown eyes, fair skin and blond hair POP in the red lipstick. I love the new song! What's all this noise about? Sorry, but I love the song. I agree with above, you really need to listen to the song a few times and then you'll find you'll want to keep hearing it. Another great one from Stevie. The lyrics are awful - on the same level as Moonlight. As if a junior high school student wrote them. But -- the performance is great. Loving her voice these days. There are moments when I'm reminded of Marianne Faithfull and Patti Smith. I've played this song 10+ times; I like it less and less. It's the lyrics. Really self-indulgent with no flow or structure. Vocally it's too flat to earn any emotional attachment. Stevie's songs, at times, only work when you hear the final product. "Angel" (off "Tusk") is a key example, and one of my favorite Stevie songs: on paper, the lyrics look disjointed to the point of suggesting the narrator's mind is either trailing off or refusing to acknowledge some troubling details. Once you get the full performance as Stevie intended (well, as close to Stevie's vision as Lindsey's stellar taste will allow ;) ), you then realize those "missed points" are part of the global performance. Would it take Lindsey for Stevie to shine most brightly? Or would it suffice to say that this song would be a quite different entity, were it recorded during sessions for a solo album of Stevie's? One must take into consideration the likelihood that this is most likely a written collaboration between Stevie, Dave Grohl, and possibly others (as Foo Fighters drummer Cameron Hawkins and another guy, possibly the FF's guitarist?, are credited on the YouTube video). The song is very reminiscent of the more downtempo-yet-electric style which appears on the Foo's albums amidst more rocking numbers and acoustic ballads. It's possible this composition was moulded into shape during a band "jam". If it's a collaboration, it's also highly likely Stevie had less time to polish the lyrics as she normally would. As for performances, if every one of Stevie's performances were like the electrifying "Rosebud" Fleetwood Mac promo film's version of "Rhiannon", I think somebody somewhere would still find a point to criticize (and, for the sake of argument, perhaps justifiably so in some's eyes). That's the chance any musician, or public persona (for that matter), takes whenever he or she steps into the spotlight. I think Stevie recognizes this, and chooses to focus on the ones who love her unconditionally (even if it means raving over less-than-perfect performances). I was lucky to see the Mac in Houston on their "Say You Will" tour, and while Stevie is far from the twirling young girl who gave herself up to the music with (at times) dangerous abandon, it is clear she is still putting her heart into things. As for myself? I'm on the fence regarding "You Can't Fix This" as a song. If I were to stereotype it, I would say it's the song I'd expect to hear on Modern Rock radio, somewhere around 8 or 9 in the evening as I'm either working on a project in the kitchen or staying late at work. And despite the fact that I find greater enjoyment in, say, Fun. 's recent singles, it is GLARINGLY OBVIOUS that their singer is auto-tuned. Stevie remains real. Or, should I say, "Reel". And as a performer, I would have to say I would have been riveted to my seat, had I happened to be watching LNw/DL when it first appeared. (Thank God for YouTube: I only heard about it the day after.) Stevie does cast a spell, even if it is comparatively subtle to the incantations she was quite willing to perform during the late '70s (before her voice dropped a register from all the abuse it took). Maybe I should get a copy of "In Your Dreams" after all. Will there be a free CD copy packaged with the documentary, deluxe-style? Will It Ever Be Cool To Like Fleetwood Mac? Fleetwood Mac: You Make Listening Fun ! Video: STEVIE NICKS "You Can't Fix This"